The choice of hemodialysis professionals for over 35 years, these compact instruments have been designed specifically to test dialysate solutions. By measuring electrical conductivity, they will quickly determine if dialysate concentrations are correct. To use these hand-held instruments, the operator simply fills the cell cup with dialysate solution and pushes a button. The needle indicates the total concentrations of salts in the solution. Model D-1 has an expanded scale of 11-15 millimhos and is useful for testing final dialysate. A unique feature of this model is the adjustable green color band above the dial. This provides an immediate visual confirmation of whether or not the dialysate concentration is within the patient’s "safe zone". Model D-2 features dual scales on the dial and can test both acetate and bicarbonate dialysate. Both instruments have built-in cell cups and are completely self- contained. They are powered by 9-volt batteries which last for at least 2,000 tests. A glow light serves as a battery reserve indicator. Thousands of Myron L® Dialysate Meters are still in daily use around the world after years of reliable service. The graph below illustrates conductivity readings of a 14.0 millimhos dialysate sample tested with a non- temperature compensated conductivity meter. The same sample APPEARS to have a higher level of dialysate concentration when heated (and lower concentration when chilled). Actually, only conductivity readings change with temperature. Dialysate concentration does not change. Some instruments ignore the importance of temperature. Others require a separate thermometer for testing sample temperature then manual adjustment of the meter. All Myron L® instruments, however, feature fast and precise Automatic Temperature Compensation. The result: a more accurate, useful instrument. Myron L® standard solutions are precisely formulated and are used to recalibrate Dialysate Meters for greatest accuracy. The 12.5, 13.4 and 14.0 millimhos Standards are the same used in Myron L® factory calibration of Models D-1 and D-2. Myron L® Dialysate Meters have a Two (2) Year Limited Warranty. If an instrument fails to function normally, return to factory prepaid. If, in the opinion of the factory, failure was due to materials or workmanship, repair or replacement will be made without charge. A reasonable service charge will be made for diagnosis or repairs due to normal wear, abuse, or tampering. 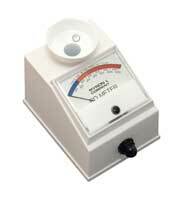 Warranty is limited to the repair or replacement of the Myron L® Dialysate Meter only. The Myron L® Company assumes no other responsibility or liability.